Goh Yew Soong has succeeded Andy Budiman as chairman of ASEAN Newspaper Printers following the group's conference in September. Yew Soong, who is engineering vice president at Singapore Press Holdings, takes over after Andy Budiman's two-year term and follows his move from Gramedia Indonesia to a new role within the group as Kompas TV executive director. ANP has set Jakarta, Indonesia, as the venue for its 2017 conference, with a date to be fixed likely to be in September. The group's sixth annual conference brought 155 delegates - 90 members and 65 partners - to the New World Saigon Hotel in Ho Chi Minh City, Vietnam. In addition to local Vietnamese attendees, member delegates who attended were from Malaysia, Thailand, Singapore, Philippines, Indonesia and Myanmar. The conference theme 'Innovate to Elevate' brought 22 speakers to share their knowledge and experiences in implementing best practices and innovation for the newspaper printing industry. Keynote speaker Hassan Mohd Ali of Star Media Group told how his production team has shown in-house innovation process has proven to add value to creative print advertising. Myanmar newspaper publisher Myo Aung told of the upward development of newspaper industry in that country. Among presentations from partner/suppliers, Hiroki Chimura of Fujifilm Global Graphics Japan shared the latest trends in processless plate processing and Jonas Rehn of MWM Group Sweden talked about how his company could improve a newspaper company's process efficiency and profitability using CopyTrack and ReelTrack. More interesting presentations followed over the two days, and conference concluded with a presentation from Farouq Mamat of Utusan Group inviting newspaper printers to be open in benchmarking their processes for regional improvement. "We also had a special appearance from Mr Teoh, the owner and publisher of the SJ Echo newspaper, sharing his experience in establishing a local community newspaper in Malaysia which has now grown into an influential must-read among locals," says ANP director and secretary Farouq Affandi. There were also plenty of networking opportunities during activities including the ANP Golf Tournament, Welcoming Dinner, a plant tour hosted by Tuoi Tre newspaper, and a river cruise dinner. "The ANP Board would like to thank local host Tuoi Tre, diamond partner Fujifilm Graphics, all valued partners and members for their contributions throughout the event," says Farouq Affandi. 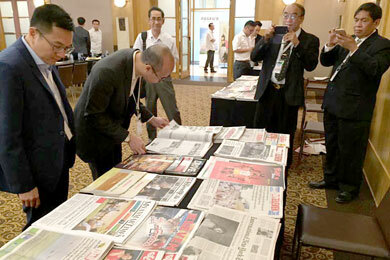 For updates on ASEAN Newspaper Printers upcoming event, please visit www.aseanprinters.org.